Imagine relaxing in a comfortable chair after a long day. Sipping a delicious beverage and taking in the calm atmosphere around you as you nuzzle a warm, furry feline purring on your lap. 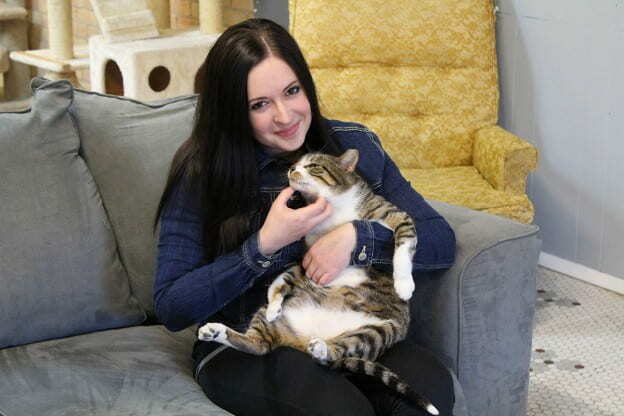 The Safe Haven Pet Sanctuary and Cat Café, owned by University of Wisconsin-Green Bay alumna Elizabeth Feldhausen ‘15, gives the Green Bay community the opportunity to experience it all. Safe Haven Pet Sanctuary and Cat Café is a non-profit, no-kill, no-cage pet sanctuary that rescues cats with special needs from euthanasia. The Cat Café is the first in the region. The cats are given a home in the Cat Café, a cozy cafe that allows customers to interact with, and be surrounded by cats. According to Feldhausen, the goal of the cafe is to create a psychologically pleasing atmosphere to encourage healing, and to build confidence in cats. 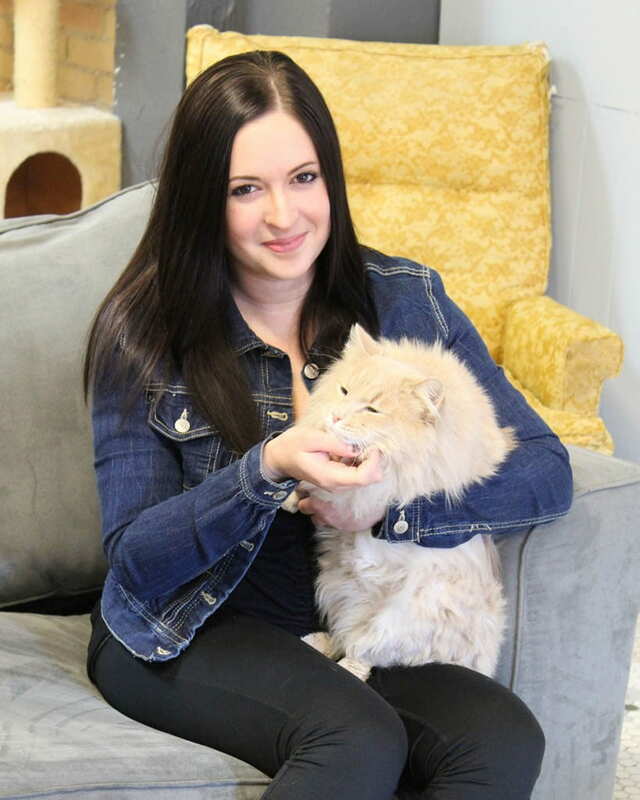 The unique setup of the Cat Café has proven successful, as more than 86 cats were adopted within the first 11 months of operation. 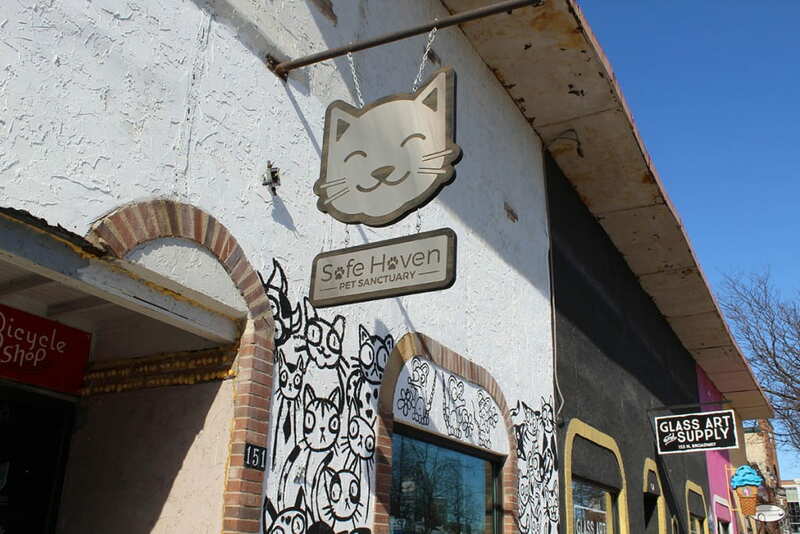 This success allowed the Safe Haven Pet Sanctuary and Cat Café to move from their location on Main Avenue in DePere to a larger location on Broadway in the heart of downtown Green Bay. Ever since she was a child, Feldhausen said she’s had a knack for taking care of and saving animals in need. She recalls taking cats under her wing growing up, fondly referring to them as her “cat siblings and stray cat friends.” The feeling of helping those animals was something she loved and she dreamed of one day opening an animal rescue, but never expected it to become a reality. After graduating from UW-Green Bay in 2015 ( Psychology and Human Development), she tried a number of different career paths before coming to the decision that she needed to give her animal rescue dream a shot. Currently the Cat Café only serves cold beverages, however, coffee will soon be on the menu as well. Until then, patrons are encouraged to visit the neighboring coffee shop, Kavarna, and bring a snack or beverage in with them. Any member of the public is invited to spend time with the cats. The café is open Noon to 6 p.m. Tuesday through Friday, 12 to 3 p.m. on Saturdays, and closed on Sundays and Mondays. This entry was posted in Alumni Rising and tagged CAHSS, Human Development, Psychology on February 14, 2018 by Sue Bodilly.